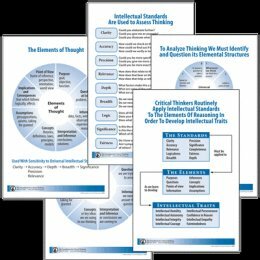 For use in classrooms or during presentations, our set of five posters keeps critical thinking at the forefront of teacher and student thinking. The posters can be purchased as set of five posters, or individually for $5.50 each. Look for them by their item numbers- 551P-555P- on our website. Please also see our other instructional materials for the classroom, such as our Laminated Cards, Wooden Stamps, Transparencies Master Pack and Critical Thinking Bookmarks. 558S5 Set of Five Posters (551P-555P) $19.90	 Qty.